In a forthcoming book, Engineers of Jihad, published by Princeton University Press, Diego Gambetta and Steffen Hertog provide a new theory explaining why engineers seem unusually prone to become involved in terrorist organizations. They say it's caused by the way engineers think about the world. Survey data indicates engineering faculty at universities are far more likely to be conservative than people with other degrees, and far more likely to be religious. They are seven times as likely to be both religious and conservative as social scientists. I am surprised, I believed engineers were far less religious than average (be it in the faculty population or general population). I haven't found the "survey data" the article talks about, but does it really indicate that? If the data is not available, do other studies confirm/invalidate this affirmation? This survey by Simmons et al. of ~1500 university professors in America shows that religious belief is negatively correlated with the academic standing of the university, and that engineering professors have some of the lowest percentages of religious belief. Psychology and biology have the highest proportion of atheists and agnostics, at about 61 percent. 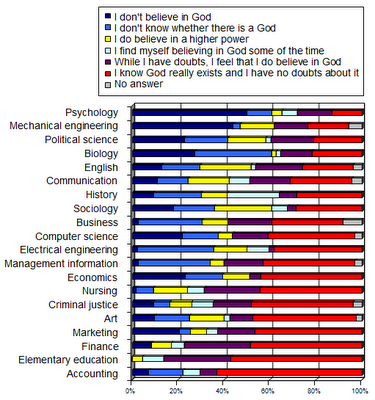 Not far behind is mechanical engineering, 50 percent of whose professors are atheists or agnostics. Behind that is economics, political science, and computer science, with about 40 percent of professors falling into this category. At the other end of the spectrum, 63 percent of accounting professors, 56.8 percent of elementary education professors, 48.6 percent of professors of finance, 46.5 percent of marketing professors, 46.2 percent of art professors and professors of criminal justice, and 44.4 percent of professors of nursing say they have no doubt that God exists. This data shows that engineering professors were in fact less religious than social scientists, in contradiction of the book cited. Not the answer you're looking for? Browse other questions tagged religion engineering . Will only 10% of the New Zealand population be religious by 2050?